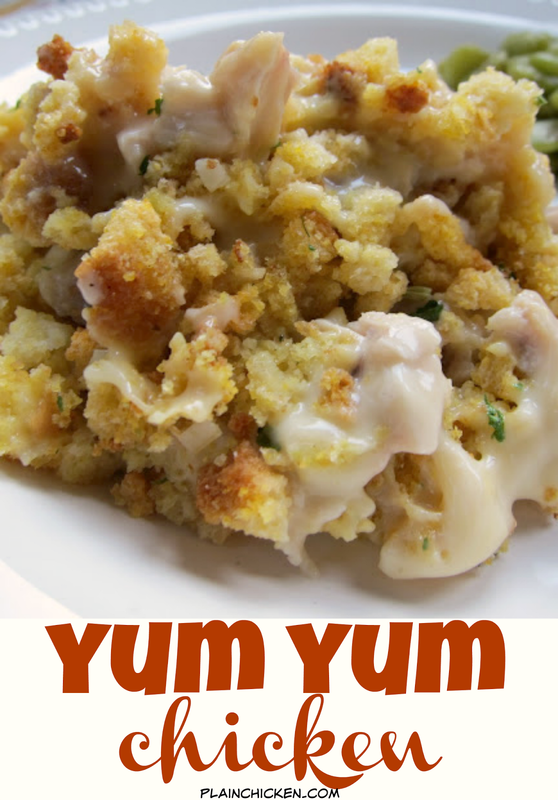 Yum Yum Chicken - creamy chicken casserole topped with cornbread stuffing. Cooked chicken, cream of chicken soup, cream of celery soup, sour cream, stuffing mix, chicken broth and butter. Can make ahead and freeze for later. Great quick weeknight casserole recipe! Kid Friendly! This recipe is from Plain Chicken reader, Cheryl Ener. This is her husband's grandmother's chicken casserole recipe. Cheryl emailed me this recipe back in June, and I am just now posting it (slacker - I know). I don't have a really good traditional chicken casserole recipe, so I was anxious to try this one out. I used rotisserie chicken and this came together in minutes. It was the perfect weeknight meal! We both really enjoyed this casserole. We now know why it is called "Yum Yum Chicken" - YUM! Thank you so much for sharing this treasured family recipe, Cheryl! To cut down on prep time, I like to use a rotisserie chicken. Chop the cooked chicken and spread in the bottom of a 9x13-inch casserole dish. Next mix together the Cream of Chicken Soup, Cream of Celery Soup and sour cream. Spread over the chicken. Sprinkle a bag of stuffing mix over the soup mixture. I like to use Pepperidge Farm stuffing mix. Finally, pour some chicken broth and melted butter on top. SO quick and easy! I had this ready to bake before the oven had fully preheated. Feel free to use Cream of Mushroom if you aren't a Cream of Celery Soup fan. I have also seen versions of this recipe with swiss cheese. Sounds delicious!!! Spread chicken in the bottom of the dish. In a separate bowl, mix together the cream of chicken soup, cream of celery soup and sour cream. Spread over the chicken. Sprinkle the uncooked stuffing over the soup mixture, (note: if herb packet is not mixed with stuffing mixture, top stuffing with herb packet). Mix together the broth and the melted butter and pour evenly over all. I have the same recipe, but we put on Swiss cheese and a sliced tomato. So good! This is my go to when I make a meal for someone or need a potluck recipe. I also put the swiss cheese in this recipe, right on top of the chicken and it's delicious! With that list of ingredients I know I would love this. The cornbread topping looks delicious. Who would not find this comforting? What a great recipe. This sounds wonderful! I think I will try it this weekend! That looks so yummy! I don't normally do this but I'm going to post my own recipe because it is soooo good and sooo easy in the crock pot...I've made it two nights in a row and would love for you to try it!!! Sounds delic! I am trying this tonight...but using whole chicken thighs as that is what I had in the freezer. Hopefully it is just as yummy! Years ago, my picky eater son came in so excited...he had dinner with a friend and his Mom cooked the best thing he had EVER had! I quickly called to see what it was, we were both good "made from scratch" cooks, this is the same recipe she gave me:) I have not made this in years, but will have to make soon, also thanks for the good flashback memory! Love your blog and read faithfully! Comfort food, for sure. I've seen a few varieties of this one but this one seems a bit easier, which is a good thing. What a beautiful photo of my family's favorite comfort food! We vary the ingredients just a tiny bit and call it Chicken Stuffin Stuff. All of our grown kids are now making it for their families. Thanks for sharing this wonderful recipe! It is absolutely fantastic! I made this the other night and it was SOOO good. Posted about it as well!!! I made this tonight and both my husband and I loved it. I forgot to get sour cream so I tried adding some shredded cheddar cheese in there to give it some tang. I can only imagine it would have been even better with the sour cream. I also added some garlic, onions and mushrooms. very good. We make it with the pepperidge farm brand stuffing and then serve it with canned cranberry sauce! So good. Do you think I could freeze this in individual portions? Katherine - I think you could freeze this. You might add a little more chicken broth when you bake it to make sure the stuffing gets moist. I have been looking for this recipe for 18 years, since my mother-in-law suddenly died and I hadn't gotten it from her. Thank you, Thank you, Thank you. I can't wait to make it. I'm so glad you found the recipe! My mom used to make this, and I couldn't remember what made the creamy sauce. Thanks for the recipe, and the memory. So I didn't have sour cream so substituted cream cheese. Hope it turns out okay! We also make this with a slice of Swiss cheese on each piece of chicken and call it Heavenly Chicken!!! Any idea what the calorie count is for this dish? OMG, this was amazing! So far all three recipes I have tried from this blog I have loved! 1-I added a bit of Swiss cheese over the chicken, as suggested in the comments. 2-I sautéed carrots, celery and onion that I chopped in the food processor, then added it to the sour cream mixture. (I used reduced fat sour cream). 3-I added 1/2 tsp sage, salt and pepper to the sour cream mixture. Just a few suggestions for everyone because my hubby and I loved this one! This was delicious! Great comfort food. I did used Campbells Healthy Choice soups. Will definitely add this to my favorite recipe list. Thanks for sharing. I made this recipe just as it said. The flavor was GREAT, but my stuffing did not get puffy and moist like it showed in the photos. Any ideas? Thanks! My 9 year old said this chicken is self explanatory (yum, yum). He is our toughest critic. If you can win him over, you know it is a hit. BTW, I followed this exactly. For the cream of cheicken and cream of celery, is it the small cans or large cans? I think I will try this tonight. The basic recipe looks amazing! I liked all the suggestions and the idea of adding vegetables to round out the dish. I also like the idea of trying poultry seasoning and salt and pepper as we like a bit of seasoning to our food. Thanks so much for this easy light recipe! I made this tonight it was so good I made pea salad and mac n cheese with it !!!! Any flavor stuffing should work fine. Enjoy! Can I use the chicken flavored or savory herbs stuffing (it is all I have I hand) or does it have to be the cornbread stuffing? I think the chicken or savory herbs stuffing would be just fine. Enjoy! This recipe was easy and delicious! I did prepare my stovetop stuffing according to box directions and poured the chicken stock and melted butter over it!!! It was amazing! Which size package of Pepperidge Farm dressing mix? There’s more than one.